I purchased this luncheon set several years ago at an estate sale. One napkin does not have the paper Japan sticker/label -- the labels state “Made in Occupied Japan”. Set consists of a luncheon size tablecloth (32 1/2” x 33”) and 4 napkins (10 ½” x 11”). 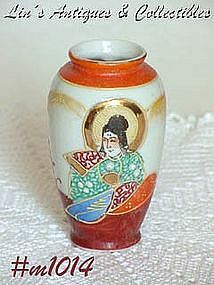 This is a cute Occupied Japan item – an urn style mini vase! 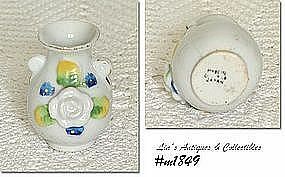 It measures 3 1/8” tall, is white with gold trim, and has a white rose on front. The rose leaves are green and yellow and there are 3 little blue flowers – just enough color to bring attention to the white rose in center of vase. The rose is raised – not flat. 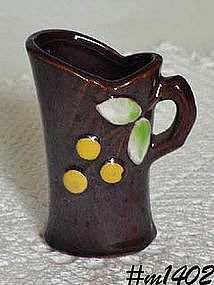 Bottom of vase is stamped: Made in Occupied Japan (there is some wear to the black lettering). 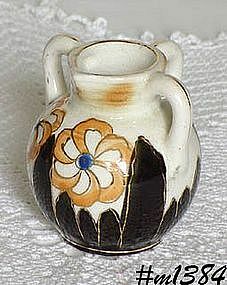 Little vase is in wonderful condition – no chips, no cracks! Super nice Occupied Japan shaker set shaped like little cabbages and are in a handled “basket” holder! 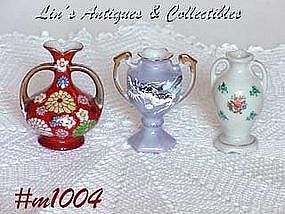 Shakers measure 1 ¾” tall, stamped Japan on bottom, and have great color with excellent mold detail. They do not have stoppers. 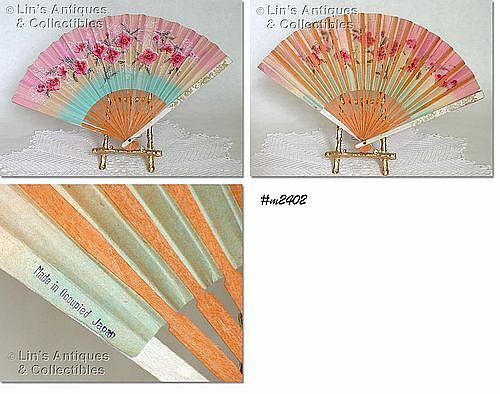 The basket shape holder is also in excellent condition (minor crazing), measures 4” long, 2” wide, stamped Occupied Japan (and has a T in a circle). Basket also has beautiful color and excellent detail! Very, very pretty set. This is a lovely Occupied Japan figurine! It’s a little boy “dressed” in blue pants, red plaid shirt, and a long overcoat. 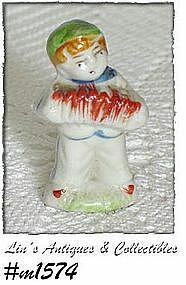 He measures 3 ¼” tall, bottom is stamped in red: “Hand painted, Made in Occupied Japan”. Excellent condition with great coloring and attention to detail! 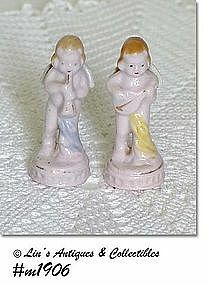 This listing has a very pretty Occupied Japan figurine! 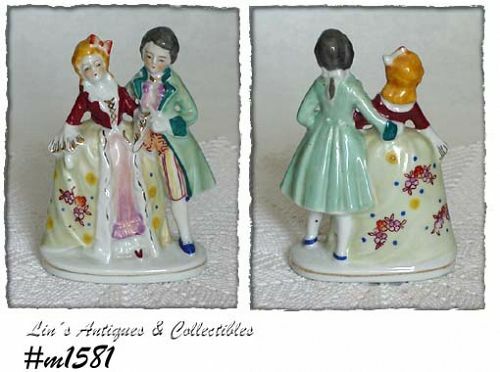 It's a colonial couple with lots of color and gold color accents on clothing. 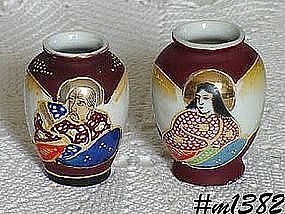 Facial features are very nicely done; figurines have lots of attention to detail and measure 6 1/2" tall (at tallest). Stamped on bottom in black: Made in Occupied Japan (lettering has worn over time but it is still legible). Very nice item, in excellent condition! 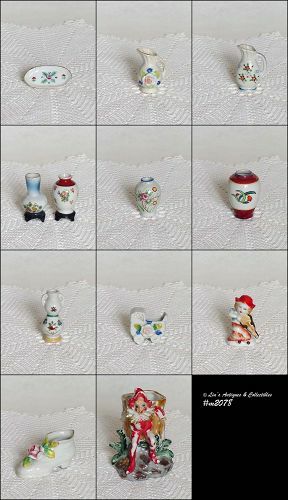 CUTE LITTLE OCCUPIED JAPAN FIGURINE! 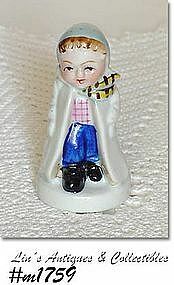 LITTLE BOY WITH AN ACCORDIAN, HE MEASURES 2 5/8" TALL AND IS STAMPED ON BOTTOM: MADE IN OCCUPIED JAPAN. EXCELLENT CONDITION. PRETTY LITTLE OCCUPIED JAPAN VASE! 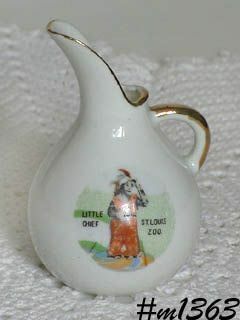 MEASURES 3 5/8" TALL, HAS SAMURAI ON FRONT, LOTS OF GOLD TRIM AND CLEARLY STAMPED "MADE IN OCCUPIED JAPAN". NO CHIPS OR CRACKS. 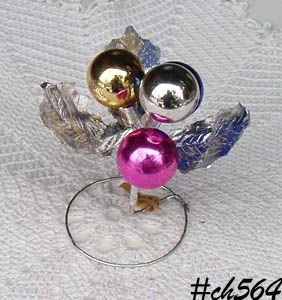 NEAT ITEM THAT MATCHES THE SMALLER (MINI) VASE WE LISTED AS OUR ITEM #M997.